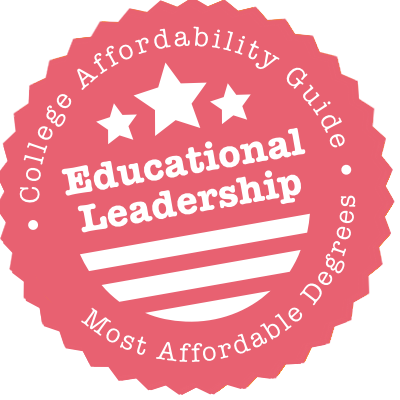 Scroll down to see the most affordable educational leadership degrees, as well as info on the different types of educational leadership degrees and educational leadership program accreditation. TAMU's Department of Educational Administration and Human Resource Development offers Master of Science (MS) and Doctor of Philosophy (PhD) in Higher Education Administration degrees. The MS program has a specialization in Student Affairs Administration in Higher Education. The PhD program allows students to concentrate their studies on areas that support their personal interests and professional goals. The department also offers the following degrees in Public School Administration: Master of Education (M.Ed. ), Doctor of Education (Ed.D. ), and a PhD. The M.Ed. in Public School Administration program prepares students to obtain a principal certification from the state of Texas. Degree candidates seeking superintendent certification should pursue either the Ed.D. or the PhD in Public School Administration program. The School of Education at UNC Chapel Hill offers an Educational Specialist (Ed.S.) in Educational Leadership degree. The program leads to either North Carolina Level I (Entry-level Principal) or North Carolina Level II (Advanced Principal) licensure. The curriculum prepares students for leadership and administration at the district office level of a K-12 school system and includes a Superintendent Concentration. The school also offers a Doctor of Education (Ed.D.) in Educational Leadership degree. Students accepted into either program who are not yet licensed school administrators are encouraged to obtain their license during the course of their studies. The school considers applicants with a minimum of three years of school teaching experience or equivalent school site experience such as social work or counseling. The Doctor of Education (Ed.D.) in Educational Leadership degree offered at UCLA is a 36-month cohort program designed for education professionals who are committed to the improvement of educational practices through research, technology, and the application of sound leadership principles. The curriculum includes coursework in the foundations of organizations and leadership, the legal aspects of educational management and practice, case-study research in education policy and practice, and procedures in evaluation. A cohort is comprised of about 25 to 30 students who take classes together one evening a week and two to three Saturdays each month. Educational Leadership students are eligible for the Federal Stafford Students Loans. The maximum amount available each academic year for this loan program is $20,500. UIC's College of Education is firmly committed to improving urban education, and its EdD in Urban Education Leadership is no different. Candidates complete a year-long internship and receive three years of coaching from former principals. Applicants are required to have hands-on school leadership experience; the program place those without current roles into positions at Chicago Public Schools (CPS). Given the close working relationship between UIC and CPS, many alumni move into permanent positions within the school district. UIC's Center for Urban Education Leadership reports that these schools post better attendance, test scores and graduation rates than other CPS schools. The School of Public Affairs at Baruch College offers an MSEd in Higher Education Administration and an MSEd in K-12 Educational Leadership. The MSEd in Higher Education Administration is offered in two tracks of study: a specialization in institutional research and assessment or a generalist program. The program curriculum fluctuates between 36 and 39 credits depending on whether students have administrative work experience. Students without administrative work experience are required to complete a three-credit internship. The MSEd in K-12 Educational Leadership requires 33 credits of coursework and prepares students for initial School Building Leader (SBL) or professional School District Leader (SDL) licensure. The School of Public Affairs offers various scholarships to its students, including the Clark Foundation Student Scholarship ($1,000-$2,500) and the Hagedorn Scholarship ($1,000-$5,000). University of Minnesota Twin Cities offers Master of Arts (MA) and Doctor of Philosophy (PhD) in Organizational Leadership, Policy, and Development degrees. Both degree programs allow students to choose an Educational Policy and Leadership Track. The MA program has an accelerated option that allows full-time students to complete the program in one calendar year. Areas of emphasis include education finance and budgeting, educational policy, elementary and secondary school administration, general administration, and personnel administration. The PhD program offers a traditional or executive plan of study. The university also offers a Master of Education (M.Ed. )/Professional Studies in Leadership in Education program, which focuses on contemporary educational issues and on leadership. Buffalo State has two programs in Educational Leadership. The Certificate of Advanced Study (CAS) in Educational Leadership is a post-master's degree program that leads to certification in New York as a School Building Leader. The 33-credit program includes field experiences and an internship in educational leadership. The Educational Leadership Combined School Building Leader/School District Leader CAS program leads to New York certification both as a School Building Leader and a School District Leader. It is a 38-credit program and includes internships at the school and district leader level. Either of these CAS programs are open candidates who have a master's degree and at least three years of teaching or supervisory experience in a preK-12 school. The Capital Area North Doctorate in Educational Leadership (CANDEL) program is designed for working professionals with at least seven years of experience in a leadership position. A one-week leadership seminar begins the program in August and classes are held every three weeks throughout the academic year. The curriculum includes courses that cover topics such as diversity issues for educational leaders, history and theory of educational policy, ethical and legal issues in education, and organizational structures and change. The CANDEL program is fully accredited by the Western Association of Schools and Colleges (WASC). The UC Davis Financial Aid Office works with CANDEL students with demonstrable financial need to identify available resources that can help pay for the cost of the program. The Department of Leadership and Educational Studies in Appalachian State University's College of Education offers master's programs in higher education and school administration, as well as an educational specialist's program in higher education. The MA in Higher Education and the Educational Specialist (EdS) in Higher Education offer concentrations in adult and developmental education, community college and university leadership, and teaching. The Master of School Administration prepares students for initial licensure as a school administrator in North Carolina. Additionally, the College offers a doctoral program in educational leadership that includes optional concentrations in educational administration, higher education, reading and literacy. Scholarships available to students in the Department of Leadership and Educational Studies include the Jim Jackson Scholarship ($500-$1,000) and the Mary Kistler Scholarship ($500-$600). The Department of Educational Leadership and Higher Education at Saint Cloud State University offers degree programs in educational administration and leadership, as well as higher education administration. The Educational Administration and Leadership program offers MS, EdS and EDd degrees, along with three post-master's graduate certificates. The Higher Education Administration program offers MS and EdD degrees. The MS in Educational Leadership and Administration requires 31 to 36 credits of coursework and can be taken on a full or part-time basis. The EDd in Educational Leadership and Administration is a cohort-based program that requires 72 credits of coursework. The MS in Higher Education Administration is a 36-credit program that allows students to choose three tracks of study: a thesis track, a portfolio track or a comprehensive exam track. Wayne State College's Master of Science in Education - Curriculum & Instruction - Instructional Leadership program is already a mouthful. And thanks to over a dozen areas of emphasis, including everything from Music Education to English as a Second Language, you can add another hyphen to the name. Want something else to add? How about a membership to Wayne Student Education Association of Nebraska, which comes with professional magazines, liability insurance and student discounts. Meanwhile, the Education Department has its own Field Experience and Certification Office to get students work experience in local schools. The Department of Educational Studies at Western Illinois University offers not only an MSEd in Educational Leadership but also a Doctorate of Education in Educational Leadership, the latter of which features a traditional track for K-12 educators and a separate one for post-secondary educators. Qualified students at both levels should apply for the Diversity Partners Program, reserved for Educational Leadership students who are members of a minority group; successful applicants receive tuition waivers. Endorsements for principals, administrators, ESL teachers and others give the department's programs a one-stop-shop feel. McDaniel College offers a Master of Science in Educational Leadership for certified teachers seeking both a graduate degree and additional certification as a supervisor, assistant principal or principal. The M.S. program curriculum requires 34 credits of coursework, including five concentration courses, two core education courses, three synthesis courses and a one-credit capstone, which consists of a written paper, an interview and the revision of a portfolio created at the beginning of the program. After completing the program, students are eligible to pursue Administrator I or II licensure in Maryland or Pennsylvania. The program may also be adapted for those who which to pursue higher education administration licensure. The Master of Science (MS) in Education Leadership program offered by WSU's College of Education has two paths to completion. One path leads to post-master K-12 principal licensure, where students choose a progression of courses that relate directly to K-12 principal preparation. The other path allows students to focus on their professional areas of interest, such as curriculum and instruction, educational technology, charter leadership, student assessment, etc. The MS program lets students choose a thesis or non-thesis option. The college also offers an Education Specialist (Ed.S.) program. Students admitted to the program can choose to complete the degree, earn a license as a K-12 Principal or Superintendent from the Minnesota Board of School Administration (MOSA), or both. The Department of Educational Policy and Leadership at SUNY University at Albany has several graduate programs and an undergraduate minor in educational leadership. The Master of Science in Higher Education prepares students for college leadership roles. School Leadership Certification programs are advanced graduate certificates for any aspiring school building leader, school district leader, or school district business leader. Students interested in research can earn a Master of Science or Ph.D. in Educational Policy and Leadership. New programs include graduate certificates in international education management and community college leadership. The School of Education administers dozens of scholarships annually, including the Avid J. Burke Scholarship for a student seeking an advanced degree in educational policy and leadership. Through its Professional Education program, Stony Brook University offers an advanced graduate certificate in educational leadership with three tracks of study: educational leadership traditional, educational leadership online and school district business leadership. The certificate in educational leadership is designed for students who hold advanced management degrees, such as an MBA, but not for professional teachers. The program can be completed on-campus or online, and students are required to receive certification at the school-district and school-building levels to graduate. Educational leadership students are also required to complete a mentored internship experience. Teachers who want to assume leadership roles such as department chair can earn a Master of Education in School Leadership from Bethel College Indiana. The college also has a program for students who want to earn the Indiana K-12 Building Level Administrator license. Applicants for the administrator license must already have a master's degree and should have at least three years of teaching experience. The administrator license curriculum requires students to complete 20 credits. The master's program is open to students who have a valid teaching license and three years of experience, and all applicants must submit three recommendations. Classes for both programs are typically offered in the evenings. Iowa State University's School of Education offers several master's, doctoral and certificate degree options in educational administration and higher education. The master's program in educational administration allows student to earn either MEd or MS degrees in educational administration and receive principal certification. Students working toward a PhD in Educational Administration can earn principal or superintendent licensure, or, if they already have licensure, complete additional advanced coursework. Students interested in studying higher education can earn an MEd, MS or PhD degrees in community college leadership, as well as a community college teaching certificate. Additionally, students can earn a PhD in Higher Education Administration, an MEd in Leadership and Learning or an MEd in Student Affairs. Through its School of Education, Ferris State University offers a Master of Science in Educational Leadership that is designed for secondary and elementary teachers looking to become school administrators. The M.S. curriculum includes seven core courses in subjects like educational leadership, curricular supervision, school business management and administrative practices. Core requirements also include a three-credit, two-semester internship in which students receive administrative mentorship from local school districts. Additionally, M.S. students are required to complete courses in school law and data-driven decision making, as well as a capstone project in the form of a portfolio or thesis. After students complete the program, they can apply for a School Administrator Certificate from the Michigan Department of Education. Educators who want gain certification as a school building leader can complete a Certificate of Advanced Study in Educational Administration at SUNY New Paltz. This is a hybrid program that combines online classwork with some class meetings held over the weekend each term at the campus or other convenient locations. The program uses a cohort model and is set up so that students take one course at a time and complete the program in as few as 15 months. The internship requirements allow candidates to work with leaders in their district to fit their internship around their work schedule so that students can continue to work full time. This post-master's program requires 30 credits, including the internship. Midwestern State University has several programs in educational leadership, including a Master of Education in Educational Leadership with principal certification in Texas or with an emphasis in bilingual education for educators in districts where many students are English language learners. The M.Ed. is a 36-credit program with principal certification and a 42-credit program with the bilingual emphasis. Students can take these programs on campus or in a blended format that includes online classes and videoconferencing. The programs require a graduate internship. Educators who already have a master's can take a standalone program leading to principal certification. Midwest uses informal cohorts of at least five students for its educational leadership program. The School of Human Development and Organizational Studies in Education (HDOSE) at the University of Florida offers Master of Education (M.Ed.) and Master of Arts in Education (M.A.E.) degrees in educational leadership. The M.Ed. program is available online. The curriculum includes coursework that cover a wide range of topics that include educational policy development, communications in educational leadership, public school law, and organizational leadership in education. Students can pursue a master's program that leads to Florida Principal Certification or one that does not lead to certification. Doctor of Education (Ed.D.) and Doctor of Philosophy (Ph.D.) degrees in educational leadership are also available. The Ed.D. degree is offered online. Ph.D. candidates have the option of pursuing a concurrent degree in law (JD/PhD). The Department of Education Policy, Organization & Leadership presents grad students with multiple degree options, including EdMs, MAs, PhDs, a CAS and an EdD. The College of Education provides fellowships for new enrollees as well as assistantships and scholarships for continuing students. Each of the college's four departments recommends a new student for the Babcock Fellowship, which gives them a $10,000 stipend plus a tuition and fee waiver for two years in return for an assistantship. The Walsh Fellowship does the same for incoming doctoral students from underrepresented groups. Students can also save time and money before becoming Illini - the school doesn't require master's degree applicants to submit GRE scores. The Department of Educational Policy and Leadership Studies runs Iowa's MA, EdS and PhD in Educational Leadership programs. Students have the option of earning a superintendent endorsement or principal licensure. The department does not offer financial aid to MA seekers, but EdS and PhD candidates qualify for funding via assistantships. Students looking beyond K-12 learners might consider the MA or PhD in Higher Education and Student Affairs, which grant graduate assistantships. In fact, the MA requires all students to have one, though remuneration varies. North Carolina State University offers graduate programs in educational leadership through the Department of Educational Leadership, Policy, and Human Development in the College of Education. Master's degrees are offered in educational leadership and higher education administration. Doctoral degrees are available in educational leadership (for K-12 schools), higher education administration, and educational evaluation and policy analysis. A graduate certificate is available in community college leadership. The department houses the National Initiative for Leadership and Institutional Effectiveness, which researches leadership and ways to improve student outcomes. To make a graduate degree more affordable, the department offers assistantships and grants and encourages students to apply for external research grants. The Graduate School of Education at Binghamton University offers an Educational Leadership program that leads to a Certificate of Advanced Studies in Educational Leadership. The certificate program is designed for experienced PreK-12 teachers who already hold a master's degree and want to attend school part-time. The program curriculum requires 32 credit hours of graduate coursework that includes seven required courses and one elective. In order to be admitted into the program, students must have at least three years of paid, full-time classroom teaching experience. After completing the program, students are eligible to receive School Building Leader and School District Leader certification. Michigan State University's College of Education offers graduate degrees in higher education, K-12 educational administration, student affairs administration, teacher education and educational leadership. The Master of Arts in Higher, Adult and Lifelong Education is a 30-credit, professional development program that is offered in an online and hybrid format. The MA in Student Affairs Administration is a 40-credit program offered by the Higher, Adult and Lifelong Education unit. Through MSU's K-12 Educational Administration program, students can earn a master's degree, Doctor of Educational Leadership or PhD. Students enrolled in the PhD in Curriculum, Instruction and Teacher Education program are guaranteed assistantships for up to five years and also have opportunities for fellowships and scholarships. Other scholarships available to education students include the College of Education Alumni Fellowship. The Master of Science in Educational Leadership degree at Minnesota State University Mankato consists of 24 credits and follows a hybrid delivery system. Students are required to complete 24 credits within the department by taking courses such as organizational and systems change, ethics and leadership, and equity and education. A Doctor of Education degree in educational leadership is also available. The program is comprised of 56 credits beyond the master's degree and designed for educational professionals seeking advanced administrative positions in school settings or in non-profit organizations. The university also offers a Specialist in Educational Leadership & K-12 Administrative Licensure degree. Students who complete this program are eligible to apply for the K-12 principal licensure or the Director of Special Education licensure. The Department of Educational Leadership and Cultural Foundations at UNC - Greensboro offers a Master of School Administration, Specialist in Education degree in Educational Leadership, doctoral degrees in educational leadership and educational studies with a concentration in cultural studies, and three post-Master's certificates. UNC is a member of the University Council for Educational Administration (UCEA), an organization on a mission to improve the development of educational leaders and administrators. The ELCF department offers several scholarships, assistantships, and fellowships to students in need of financial assistance. UNO students who are interested in an educational leadership program can pursue the Master of Science (MS) in Educational Leadership degree offered by the College of Education. The program is designed for experienced certified educators who are seeking to complete the requirements for principal, curriculum supervisor or special education leadership certificate. Classes are offered in a blended format (50 percent online and 50 percent on campus). There is an Educational Specialist (Ed.S.) in Educational Leadership degree available. Candidates must have a master's degree and administrative certificate to be considered. The college also offers a Doctor of Education (Ed.D.) in Educational Administration program designed for students with an administrative certification seeking further expertise as a practitioner in their chosen field of education. Northwest Missouri State University's Department of Professional Education offers Master of Science in Education and Specialist in Education degrees in education leadership. Students can earn an M.S.Ed. in Education Leadership with concentrations in elementary, K-12 and secondary education. Education leadership Ed.S. degrees are available in elementary school principalship, secondary school principalship and superintendancy. The Specialist in Education degrees are post-master's degrees that require 32 credits of coursework in school law, school supervision, school and community relations and the philosophy of education. Students are also required to complete a field study experience, internship and two seminars. The K-12 education leadership M.S.Ed. program is a 32-credit program that includes a three-credit practicum. City College of New York offers several educational leadership programs, including a Master of Science in Education - School Building Leader program. Other programs are an Advanced Certificate in Educational Leadership - School Building Leader; Entry Level Leader Certification program, and an Advanced Certificate in School District Leader. The educational leadership program uses a cohort instructional model, in which all students begin the program at the same time and work through the program as a group. Each cohort is assigned a faculty liaison who serves as an adviser. Classes are held one day a week, either on campus or online. The M.S.Ed. program requires candidates to complete 11 courses, including a Building Level Internship and Seminar. The Department of Teacher Education at Texas Woman's University offers two graduate degree programs in Educational Administration - a Master of Education (M.Ed.) and a Master of Arts (M.A.). The curriculum includes courses in education law, administrative processes in schools, leadership in educational settings, and curriculum development, assessment, and evaluation. The department also offers coursework leading to recommendations for Texas Principal Certification or Texas Superintendent Certification. In order to be recommended for these certifications, candidates must have the following: a Master's degree, valid Texas Teaching Certificate, and three years of teaching experience. The Texas Superintendent Certification also requires candidates to have a valid Texas Principal Certificate. UNC Charlotte has two graduate programs in educational leadership, a Master of School Administration and a Doctor of Education in Educational Leadership. The Master of School Administration program requires students to earn 39 credits, with 12 of those credits covering a yearlong internship under the direction of a principal-mentor. By earning the degree, students qualify for a Level 1 School Administrator's license in North Carolina. Students may complete the program on a full-time or part-time basis. Classes are offered on the Charlotte campus and at some distance education sites. Students in the Ed.D. in Educational Leadership program select a school specialization or a community specialization. The program prepares graduates for mid-level and senior leadership positions in schools and colleges. Brooklyn College offers a Master of Science in Education degree in educational leadership. Completing the 36-credit, three-semester program enables candidates to apply for both the New York State Building Leader certificate and the New York State School District Leader certificate. The program is designed for currently licensed educators who work in public or private schools serving any K-12 grade range. Students can enter the program in the fall or spring semester, and the curriculum is structured to create small, cohort-based groups. Candidates must complete the program within three years, and they are required to complete a capstone fieldwork portfolio project to finish the degree. The Teacher Leadership Graduate Certificate program at SUNY Plattsburgh provides teachers with the skills to serve as instructional leaders without completely leaving the classroom. Another program, the Certificate of Advanced Study in School Building Leader, qualifies graduates for the New York State Administrative Certificate at the building level. This program accepts credits from the Teacher Leadership Graduate Certificate program which allows students to complete the program at an accelerated rate. Students can build on their School Building Leader Certificate to earn the School District Leader Graduate Certificate with just another semester of internship experience. Coursework for all these programs are available on campus as well as online, and students can choose to pursue the programs on a full-time or part-time basis. The University of North Texas offers a Master of Education in Educational Leadership as well as a Doctoral Program in Educational Leadership. The Master of Education in Educational Leadership is also available in an accelerated online program, which is a 30-hour program that takes place over ten courses, taught in eight-week terms. Graduate Assistantships are provided to graduate students on an extremely competitive basis. These programs are specifically meant for those who are seeking advancement in school districts or other educational institutions as administrators in schools or in other leadership positions. The College of Education was ranked 13th in the country by U.S. News and World Report for Best Online Graduate Education Programs. The College of Education at USF offers a Master of Educational Leadership (M.Ed.) program that requires applicants to possess a Florida Professional Educator's Certificate and have at least two years of post-bachelor teaching experience. The college also offers an Education Specialist (Ed.S.) degree with three emphasis areas: turnaround school leadership, exceptional student educational leadership, and exceptional and diverse student education (available starting summer 2016). A Doctor of Philosophy in Educational Leadership degree is offered as well. Doctoral students are required to complete coursework in the following: organizational leadership and systems theory, legal dimensions of school administration, policy analysis and implementation, and curriculum theory and analysis. Students can apply for the Dr. Myndall Hall Stanfill Memorial Scholarship in Education Leadership ($500). Graduates of educational leadership programs are unique individuals. They may serve as principals in urban public schools, instructional coordinators in rural school districts or deans of students in universities. On a daily basis, they deal with thorny issues surrounding school finance, community relations, staff management and student welfare. They lead by example, demonstrating a superhuman ability to manage complex organizations. But they don’t do it by instinct. Apart from being the baseline requirement for many jobs – including principalship – a degree in educational leadership is designed to prepare administrators for the tasks just outlined. In this guide, we cover the ins and outs of each degree program, what you need to know about regional and program accreditation, how advanced state licensure works and the latest on voluntary board certifications. Educational leadership is usually reserved for graduate level-study. However, there are plenty of education degrees that offer undergraduate coursework in administration. These can prepare you for the road ahead. For more information on earning a bachelor’s degree in education and a guide to initial teacher licensure, please see our article on Affordable K-12 Education Degrees. A master’s degree in educational leadership is a 1-3 year program that focuses on skills needed to lead a school or district. The majority of public school systems expect principals, assistant principals and school administrators to hold a master’s degree. Before you can enroll in a master’s program, many universities will want to see proof of a bachelor’s degree in education (or a related subject such as school counseling), a K-12 state teaching license and/or substantial teaching experience. After you have earned your master’s degree, you can then apply for state licenses and endorsements for leadership positions. Because school leaders are – in one sense – running a business, you will also find joint Master of Business Administration (MBA)/MA in Educational Leadership programs available. These typically integrate courses and skills from the business school. Some degrees also include specializations – e.g. community college leadership – that may apply to your chosen field. We outline the general differences between MEd and MA/MS programs in our article on Affordable K-12 Education Degrees. If you’re having difficulty deciding on which degree to earn, the best approach is to discuss your goals with each graduate school on your shortlist. In addition to traditional classes, you will usually have to complete a thesis or research-based capstone project. A number of universities will also arrange internships where you can put into practice all you’ve been learning. Although some students earn this degree in order to become school principals or superintendents, career opportunities are varied. Graduates also work as school or district-level administrators, instructional coordinators, academic deans, department chairs, union leaders, staff in state education departments, directors of educational non-profits and heads of community colleges. Add-on certificates and endorsement programs are designed for licensed teachers who wish to earn an additional endorsement on their state teaching license. We discuss these programs in-depth in our article on Affordable K-12 Education Degrees. One thing to watch – be sure that your endorsement program is approved by your state before you apply. Universities should list this clearly on their websites. Above a master’s degree but below a doctorate, the Education Specialist (EdS) is a practical degree that takes 1-2 years to complete. Candidates must usually hold a master’s degree and have teaching experience in order to apply. For more details, check out our section on EdS degrees in Affordable K-12 Education Degrees. A doctoral degree in educational leadership is a 4-7 year program focused on advanced research and practice. As with the master’s, doctoral candidates are usually expected to have a teaching license and/or significant teaching experience. We outline the differences between an EdD and a PhD in our article on Affordable K-12 Education Degrees. The general rule of thumb is that an EdD is focused on the practical application of existing research and the PhD is concerned with creating original research. Doctoral coursework builds on the skills and theory laid down in the master’s degree. You may find yourself going deeper into issues surrounding business and leadership, including resource allocation, budgeting, supervision and finance. In later years, you’ll be immersed in advanced research techniques and expected to devise a research project or dissertation related to your field of interest. A doctorate will set you up for top educational leadership positions, policy work, university teaching and high-level research. If you’re hoping to become a respected educational leader, we suggest you attend a college or university with regional accreditation. This “seal of approval” is granted to (mainly) non-profit and public institutions by one of six regional accrediting bodies (e.g. Southern Association of Colleges and Schools). If you’re interested in the quality of the program itself, you should also see whether it has CAEP/NCATE/TEAC accreditation. The Council for the Accreditation of Educator Preparation (CAEP) is a merger of the National Council for Accreditation of Teacher Education (NCATE) and Teacher Education Accreditation Council (TEAC). This organization is responsible for accrediting teacher education programs. All programs currently accredited by NCATE and TEAC will eventually be approved by CAEP. In the meantime, look for NCATE or TEAC accreditation on the university’s website. Before you can pursue a state license for school principalship or superintendency, you will usually be expected to earn your initial teaching license. We cover this procedure in our article on Affordable K-12 Education Degrees. Once you have your initial license, you can look at advanced licensure and endorsements related to administration. Each state has a slightly different approach to school leadership, so we suggest you consult your State Department of Education for details. You will generally be required to hold an accredited master’s degree in order to qualify. Administrative Specialist License: Specific license fields include school-community relations, educational staff personnel administration, vocational education administration, etc. Requires a master’s degree or higher. Principal License: Specific license fields include grades PK-6, grades 4-9 and grades 5-12. Requires a master’s degree or higher. Superintendent License: Can be added to a principal or administrative specialist license. Requires a master’s degree or higher. Ohio also offers an Urban Principal endorsement that can be added to the standard principal license or certificate. After going through state licensure, some education professionals choose to seek voluntary certification from independent organizations like the National Board for Professional Teaching Standards (NBPTS). Unfortunately, after spending $3.5 million on a five-year pilot program, NBPTS scrapped its effort to create board certification for principals in 2014. This decision created a lot of anger among participants. Happily, as of 2015, the American Association of School Administrators (AASA) continues to offer its National Superintendent Certification Program.